The women over at Historical Tapestry are hosting the Historical Fiction Challenge. I alwazs want to read more historical fiction - I love learning about life in other time periods and, as long as they're well-researched, historical fiction books are great for that. 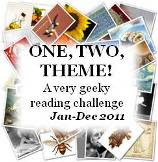 This challenge has several levels and I choose the 'Daring and Curious' level, so 5 books in 2011. The great thing is that all historical fiction counts - including YA and fantasy. yay! Some ideas are below, but I'm not committing to a list! Thank you for joining in on the Historical Fiction Reading Challenge! Enjoy your books!